Voicing gives the piano individuality and character. Within the parameters set by the hammers, belly, and room acoustics, a voicing can modulate tonal projection and control the progression of tonal color at different dynamic levels. Voicing or “tone-regulating” can be defined as adjusting the piano’s tonal characteristics by manipulating the shape, mass, density, and stiffness of its hammers. Most people see voicing only as a way to manipulate timbre—to make a piano sound brighter or mellower. 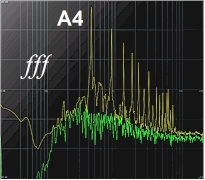 However, the hammer damps high partials in soft playing, whereas it releases their full spectrum on hard blows. This creates a tonal gradient that makes the piano as expressive and versatile as it is. 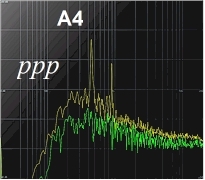 The spectrograms to the right, depicting the partials produced by the same hammer in very loud (fff) and very soft (ppp) playing (without the use of the soft pedal), show how dramatic the timbral variations can be. They illustrate why a skillful player can create orchestral effects on a well-voiced piano. A concert-level voicing doesn't only ensure a mellow ppp and brassy fff, but provides a natural and expressive progression of color from one end of the spectrum to the other. Recognizing and controlling this progression requires a high degree of skill and experience. Voicing can’t change the basic tonal character of the piano or the hammers—it is a way to release a piano’s potential and even out its tone. If the hammers or belly constrain the tone in any way, it is best to address deficiencies in those areas before performing fine voicing.